Set for Tuesday, February 13, this year's parade will start at 8 pm in the hotel zone and proceed down the Malecón to Los Muertos Pier. Gather your masks and friends and get ready to catch beads by the handful! Puerto Vallarta, Mexico - Gather your masks and friends and get ready for CarnavalPV. This year's parade is going to be bigger and better than ever as Puerto Vallarta celebrates its 100th anniversary as a municipality and 50th as a city. On Tuesday, February 13th, the annual three-kilometer parade celebrating Mardi Gras will begin at 8 pm in the hotel zone and proceed down the world-famous Malecón to Los Muertos Pier. Make plans now to come out and enjoy the incredible floats, colorful costumes, towering stilt walkers, street performers and dancers that are all part of the festivities in Puerto Vallarta, and of course get your hands ready to catch some beads. 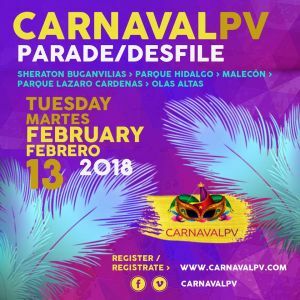 Businesses, organizations, schools and individuals who wish to take part in this year's family-friendly parade can register online at CarnavalPV.com. Check out last year's video on the website and, while you're there, follow us on Facebook for the latest news. PVRPV.com will be offering $10,000 pesos to this year's Most Creative entry. Last year's event brought over 30,000 cheering residents and tourists from all walks of life together on the city street curbs and sidewalks to be wowed by floats and parade participants celebrating the diversity of our city. This year's city-sponsored event is sure to bring even more people to Puerto Vallarta. CarnavalPV brings together gay, straight, light, dark, male, female, old, and young, all for a collective purpose, to get as many beaded necklaces as possible. Don't miss the fun!